We offer two really special topics oriented and diverse guided tours for you and your children: during the Dragon Tour the children will do an exciting paperchase and discover numerous dragons, which are of particular importance for Barcelona. During the Columbus Tour the adventureous expeditions of the discoverer will delight both children and adults equally. Not included are admission fees. Perhaps your children would like to visit the Columbus monument (Columbus Tour). Here you can purchase tickets, however the guide will ask you before the tour if you would like to get tickets. The Dragon Tour and the Columbus Tour can be booked for Mondays until Fridays at 10:00 and 16:00. Other times on request. Booking is really simple: Please enter the date, time and the group size you would like to book for on the upper right. Click on "Add to cart". The children should not bring heavy backbacks. However they should bring a small bottle of water and a small snack. The minimum number of participants amounts to 4 persons; in case of fewer participants the tour may be cancelled. In this case you can book a private tour. Please let us know in advance if your child has food intolerances or allergies. During the tour the children can taste a variety of different spices and groceries. 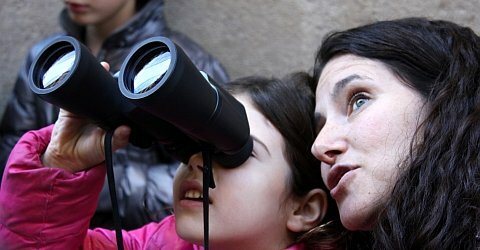 During the private tour the topics will be brought near to your children in a playful way by experienced travel guides. During the Dragon Tour your children will do an exciting paperchase and discover numerous dragons, which can be found on squares, facades and fountains.The Columbus Tour will delight both children and adults equally. During this tour your children will discover many interesting facts in a playful way: How did Columbus' expiditions take place to the new world? Was he really the first European to set foot on the American continent? Only your group will participate in this tour: during this 2.5 hours long interactive guided tour your kids will be the protagonists of the adventure and will be integrated at all times. This way they get the chance to follow their urge to explore and to find answers to many exciting questions. They will learn about the powerful symbolism of the dragon and why it became one of Barcelona's emblems. The children will also learn about the meaning of dragons in other cultures. A lot more questions will be answered during this interactive tour: For example why is there half a house standing in the middle of the district El Borne? Why was beeing an executioner such a renowned job? How many geese live in the cloister of the cathedral and why? We will give answers to those questions appropriate to the age of the children and thereby will give them a lot of interesting information about Barcelona's and Catalonia's history. In the end of the tour we will be able to distinguish many important characteristics about different dragon species: the Asian and the European dragon as well as the dragon of the ocean, the forests and the mountains. The tour ends at the Ramblas where a dragon dances with an umbrella. Only your group participates in this tour: How did people from 500 years ago imagine what the world looks like? What was life like in a harbour city in 1492? And what about on a caravel? How did Columbus' expiditions to the new world occur? Was he really the first European to set food on the American continent? We will betake ourselves on a fascinating trip to the past looking for traces of Columbus, the new world, Native Americans and chocolate, where we will find answers to all the questions. Together with your children the events will be ordered on a symbolic timeline to join the dots in between each event. We will explain to the children - of course appropriate to their age - which impact the discovery of America had on the aboriginies, what slavery means and how important it is to learn showing mutual respect and appreciation to people from different cultures. Why Book the Guided Tour for Children? Especially children need a special approach and more attention than adults. During the guided tour for children, it's all about the little ones. The children are playfully included in the two topics of the Dragon Tour and Columbus Tour. The children are challenged, because they need to participate in this tour. For them these two tours are certainly a highlight of the stay in Barcelona. Please enter the number of persons you want to book for. For adult companions (for example parents) a booking is also required. Our partner: Kids&Cat, 08002 Barcelona, Calle Calella, 3.2.